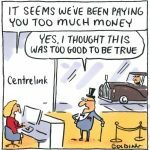 Centrelink has been fraudulently issuing debt notices to people who owe no money. Persons so identified are then harassed and threatened to the point that they pay this un-owed debt rather than being penalised by a system, which they already know actively disparages them. 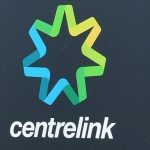 Labor’s Anthony Albanese, while being concerned about this government’s debt collection said, “No one would argue [against] that if someone has a debt from Centrelink, had payments to which they were not entitled, then it should be repaid“. I would argue to the contrary. 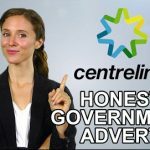 Centrelink’s services exist to ensure the disbursement of social security payments whether that be for unemployment, or aid for families, carers, the disabled or indigenous. That financial aid in many cases has rarely increased, and in some has decreased in terms of CPI value. 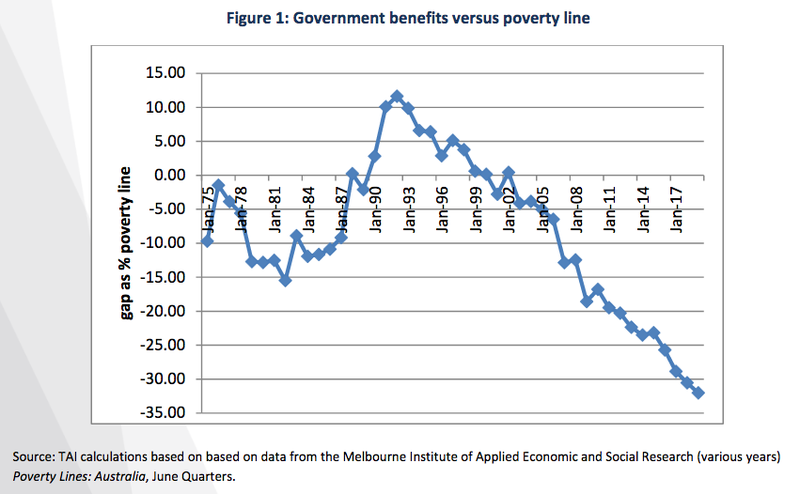 In the case of the baseline unemployment benefits, though indexed to the CPI, “there have been no legislated changes to real Newstart rates in over 20 years”, in fact since 1996.
and the ABC (although that was prior to it’s current management). Rorters! from Welfare or Multinationals? 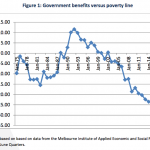 These inadequate payments entrench poverty, inhibiting rather then aiding workforce participation. Mobility, presentation, education, literacy, and skill acquisition all cost money. Financial stress adds to social marginalisation. Bullying by the job networks and policy victimisation generates social ostracisation in the community, and also limits possibilities for the unemployed and disabled. So sorry Anthony, but I am very much inclined to believe that if anyone got a little more money out of this dysfunctional system than the government was prepaired to provide, then they deserve to keep it. Any extra money would only increase their chances of improving their lot, including their ability to contribute to the economy and to finding work. 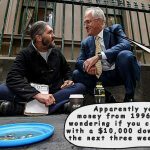 Instead of attempting to recoup $3.5 billion in alleged “welfare debts”, why is the government not energetically recouping $6 billion from the tax dodging multinationals? 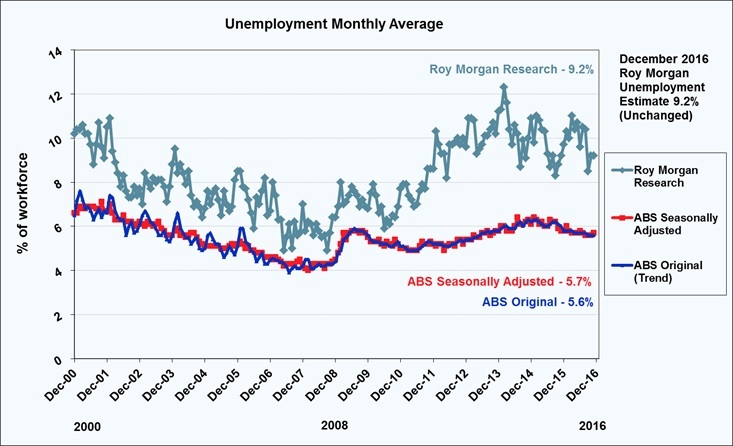 The divergence between the Government’s unemployment numbers & Roy Morgans. the new entrants to the unemployment lines as car manufacturing in this country vanishes. And now, just to add to the psychological and financial pressures inherent in looking for work, the government has come up with a new strategy to inhibit your search, by occupying your time with digging up old payroll records. The news of this new tactic is ever-present. 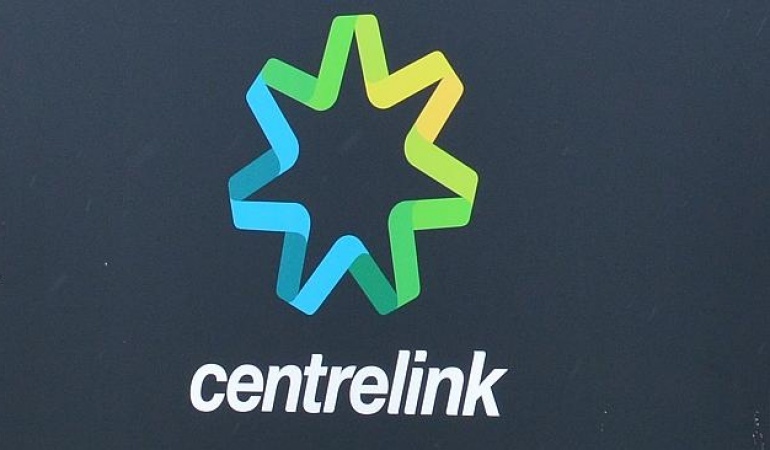 20,000 people a week receive notices of debts – allegedly to recoup incorrect welfare payments. All of which are triggered by an automated debt recovery system, which is under intense criticism because of what is essentially, the (intentionally?) flawed logic of a computer algorithm. 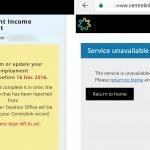 Centerlink’s computers (IBM machines in case you were wondering) are attempting to match tax office data with Centrelink records to determine if there are discrepancies between Centerlink financial information and Tax office records. But an inherent incompatibility exists between these two data sources, and it is a matter of timing. Centerlink has information about its payments made fortnightly, and possibly data relevant to jobs which clients were offered and accepted. Centerlink is unlikely to be aware of the continuing circumstances of that job or subsequent ones found independently in the course of any given financial year. The tax office has only an annual summary of income. There is no breakdown into weeks, fortnights or months. There is no breakdown of pay rates, when it was specifically known they earned it, or what changes to income streams occurred in the course of the year. The tax office data is therefore incompatible with Centerlink’s data. The government is comparing apples with oranges. 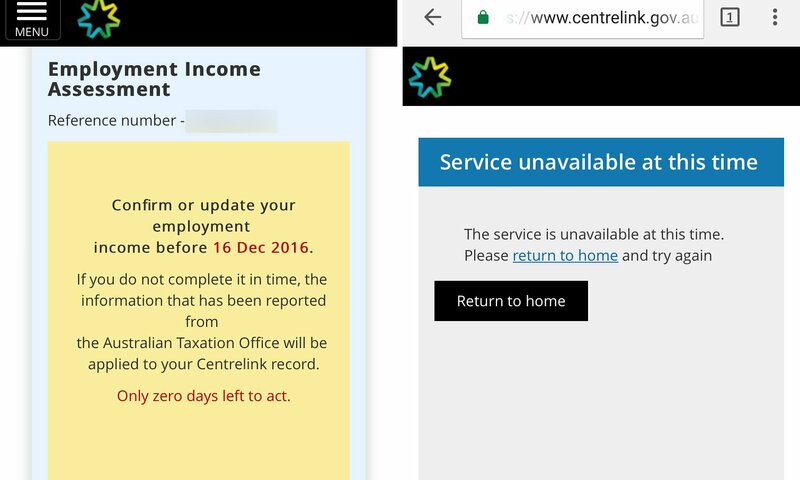 Despite this, Centrelink’s algorithm takes your yearly income as reported to the ATO, and averages it over each fortnight of the year. As any primary school age statistician would recognise, an annual “average” apportionment cannot measure individual fluctuations and is a flawed measure in any given fortnight. To assumes absolute consistency for all fortnights is absurd on a number of levels. 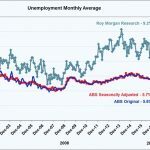 The only group that may get close to this pattern are the fully employed and even then, there are allowances, overtime, uneven hours, holidays, sick leave, RDOs, wage rises, wage falls, changes of roles, and any manner of occurrences that will alter the payroll for any individual over any given week/fortnight. Certainly, the most unstable employment group and the most likely to have variants are the unemployed. It is common sense that if you are dealing with people who move in and out of employment in any given year where they may move from poverty one fortnight to sufficiency (or if lucky, excess) the next. It is common sense that averaging their yearly income will produce inaccurate results by which to measure any given actual fortnight. So what does Centerlink do? 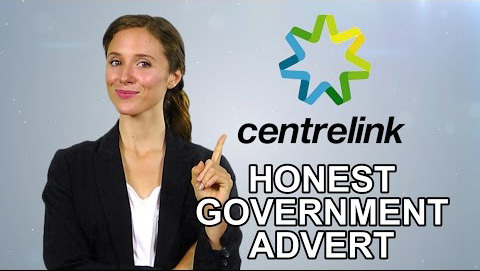 They take the ACTUAL fortnightly records held by Centerlink along with any limited volunteered data and try to cross-reference it against a fortnightly averaging of annual taxation income data. The normal presumption of statistical probability would tell you the likelihood of such figures matching for this demographic, is extremely unlikely. You would have to presume the mismatches will be the most common occurrence. Any programmer (and I worked as one for most of my career) would tell you such a matching is deeply flawed. Therefore clients should be approached with the assumption of innocence. In the absence of specific information in Centerlink’s internal records for discrepancies, inquires should be made tentatively as to why there might be a prima facie case for a mismatch in numbers. The onus of proof should also be on Centerlink (and not the client), as the process is so obviously flawed. Something fully recognised internally within Centerlink, if not by the political policy makers. In the face of the inherently flawed logic of this approach, innocence till proven guilty would be the legally prudent course of action. So what does the government decide is the best course of action? To implement a process that presumes people to be guilty (of debt) till proven innocent. 20,000 Welfare recipients a week have been receiving notices that they have 21 days to prove their “innocence”, or be hit with penalties. These include a 10 per cent debt recovery fee, jail time, a restriction on travel. The event for which they are being investigated may be anywhere up to six years in the past. Some recipients are paying up, not because they accept that they actually owe the debt, but simply because they can’t locate evidence from past years, or because they fear the repercussions of a punishing government bureaucracy. If you have ever had to deal with Centerlink or any of its private job network partners you will be well aware of how punitive they are. Surprisingly to the government – apparently – this is producing a backlash. Human Services Minister, Alan Tudge, insists the automated process is not flawed and despite protests to discontinue the letters he is forging ahead with gusto. 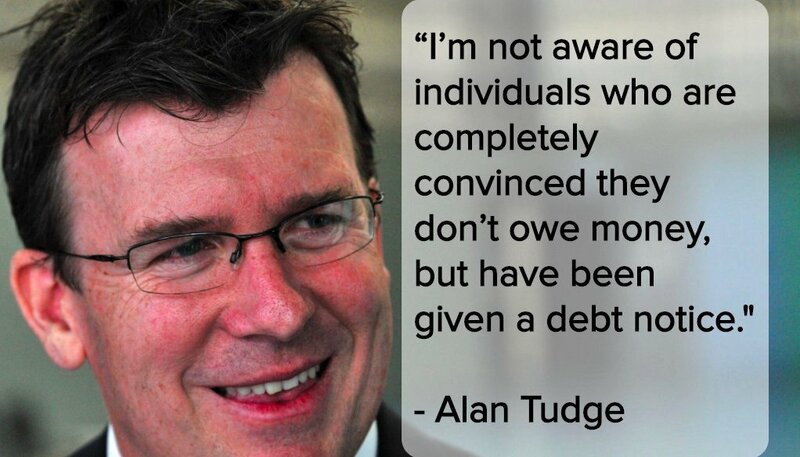 For Trudge to declare, “he wasn’t aware of anyone who was completely convinced they don’t owe money but have been given a debt notice” is either grotesque wilful ignorance or a lie in the face of a growing body of evidence otherwise. When even “Liberal Senator Eric Abetz acknowledged there seemed to be problems with the system“, then you know it has to be disastrous. The one aspect of this (that nobody appears to be talking about) is the sheer workload this must be creating for Centerlink. Let’s assume Alan Tudge is correct that the error rate is only 20%, which is contrary to what centerlink whistle-blowers reveal is the case. Giving him the full benefit of the doubt, 20K letters a week represents 4K fraudulent claims a week. Which is 16K a month and 192K a year. After 1.04 million data matching discrepancy letters in a year, they will not even cover all the numbers of unemployed in this country (1.186 million – see above), let alone all the other welfare recipients for other reasons. Alan Trudge expects the system to “generate 1.7 million compliance notices”, which by his own estimates means at least 340,000 letters in error. Of course, the Centrelink compliance officer whistle-blower that spoke to the Guardian suggests the percentages of errors are vastly larger. Given that all of this was not only easily identifiable but unavoidably self-evident prior to the system being switched on, how is any of this not fraudulent? At the current letter-writing rate (if they can maintain it) this will take over a year and a half to complete, although Mr Trudge thinks it will take 3 years. By then Australian Lawyers will be in a feeding frenzy of class action suits with minimally 340,000 clients with legitimate grievances with the government. This will presumably still be an ongoing issue by the next election. According to 2014 Centerlink data there were 14.459 million Social Services payments made in the March 2014 Quarter to 50% of the population – interestingly, a reduction from previous numbers. There are only 13.5 million voters – according to AEC – who voted in the last election. This is not a vote winner. But presuming you are not expecting to win the next election, leaving this mess on another party’s door to cleanup provides a damaging handicap. 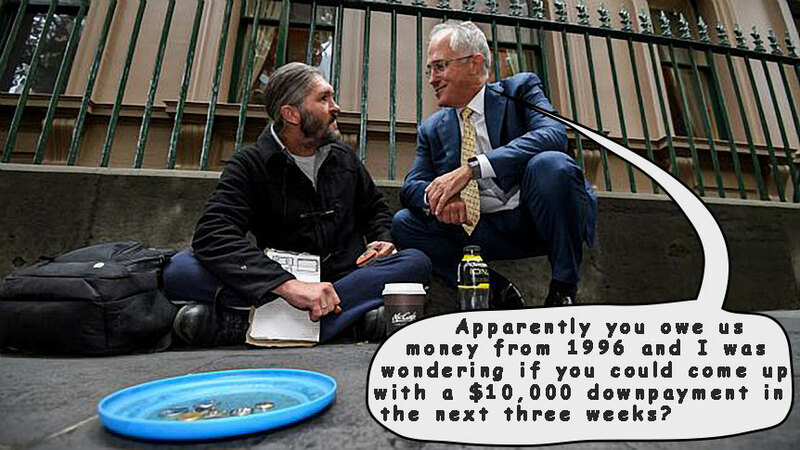 The amazingly short-term memory of the public, gives the coalition an advantageous opportunity to disparage what the next government will have to do to rectify the situation. Putting aside the legal costs, consider then the other real cost in man-hours for Centerlink to resolve each erroneous issue when there are minimally 4000 cases a week. To keep on top of the “erroneous” case load – if Mr Trudge is correct – requires the equivalent of 105 Centerlink officers processing each claim within an hour in a 38 hour week. This presumes the ability for each officer to address, research, confirm and redress an error on each letter in one hour and do no other administrative work. There appears to be mounting evidence it takes much more time. Plus that does not factor in the equivalent of the 421 Centerlink officers devoting a single hour in a 38 hour week, that you’d need to process the claims – and not fall behind – which Mr Trudge believes are valid. But these figures are conservative. As I previously explained, the error rate is far larger according to the Guardian’s Centerlink whistle-blower. The backlog of work is just going to be extraordinary, if it isn’t already. No wonder it is so difficult to get through to Centerlink on the phone. 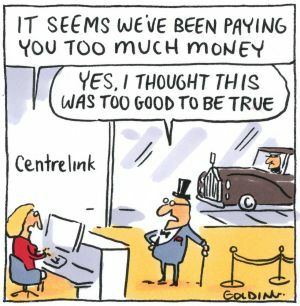 It was nearly impossible to get Centerlink on the phone when there was only 20,000 debt recovery letters sent in a year but now that they are doing it every week …. ? As for other means of communication, even compliance officers are complaining they cannot access the Centerlink online system efficiently, let alone customers. 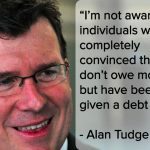 In truth, even if Alan Trudge did put an end to it; Centrelink will probably still be spending thousands of man-hours dealing with the consequences of this flawed and fraudulent system. 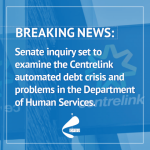 The same would be true if the Commonwealth Ombudsman began investigating Centrelink’s debt recovery system and put a stop to it – disregarding the costs in legal redress, which are sure to follow. Nothing about this course of action makes any logical sense, except to see this as class warfare against our vulnerable and easily disparaged citizens. Well at least, it will probably increase employment opportunities in the community at Centerlink that will giving a few folk some extra, well sought after work. But wait, isn’t there a public service full time employment freeze? 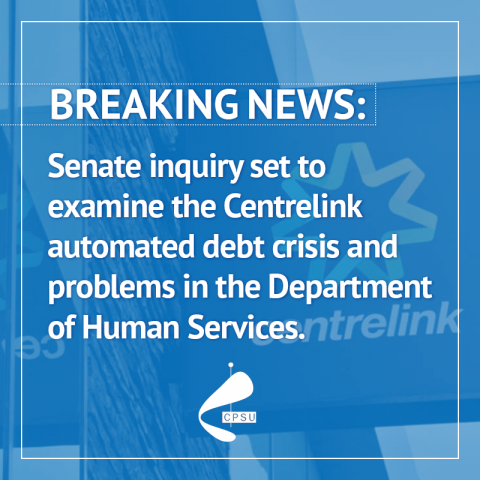 Senate inquiry into Centrelink launched from 8th Feb 2017.
when repeated anecdotal evidence said it was much longer. Statistical evidence being more credible (if collected accurately) than anecdotal. the government’s claims were not in accordance with the aforementioned backlog , as logically it should have been longer. As you may be aware the Senate on the 8th of February confirmed an inquiry into the automated debt system would be launched. A Senate question raised by Labor senator Louise Pratt finally got to the bottom of this mystery on Thursday 2nd of March. “A transfer to a new line becomes a new inquiry, and the clock would start again,” Human Services staffer Barry Jackson said during a Senate estimates hearing. Basically by Centrelink staff transferring your call to another phone on a regular basis and only measuring time between two specific phones, then the “wait-time” is kept low. Centrelink does not measure the total time any client spends on the phone but how long you are connected to a specific phone within Centrelink. It is a contrived and deliberate deception so Alan Tudge can make a claim that call waiting times are short.